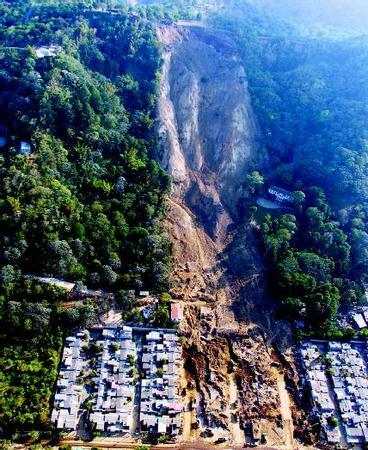 Landslide in San Salvador, El Salvador, resulting from a powerful earthquake. Gravity is the physical force of attraction between any two objects in the universe. One of the four fundamental forces (the others are electromagnetism and the strong and weak forces), gravity affects all objects on Earth. From the largest mountains to the smallest grains of sand, gravity pulls everything in a direction toward the center of the planet. As long as material remains on a flat surface, one that is parallel to Earth’s surface, gravity will not cause it to move. When material is on a slope and conditions are right, however, gravity will cause it to fall, slide, flow, slump, or creep downward. That downhill movement of soil, rocks, mud, and other debris can be either slow or fast. Large amounts that move quickly are perhaps the most widespread geologic hazard. Each year in the United States, ground failures of various sorts cause between twenty-five and fifty deaths and roughly $1.5 billion in economic loss. In less-developed nations, where poorly constructed buildings house many people in areas prone to ground failures, the death tolls and amount of property damage are much higher. Geologists use the term mass wasting to describe the spontaneous movement of Earth material down a slope in response to gravity. This does not include material transported downward by streams, winds, or glaciers. Mass wasting plays an important role in the overall process of erosion, which is the gradual wearing away of Earth surfaces through the action of wind and water. Through mass wasting, material from higher elevations is moved to lower elevations where streams, glaciers, and wind pick it up and move it to even lower elevations. Mass wasting occurs continuously on all slopes. While some mass-wasting processes act very slowly, others occur very suddenly. The general term landslide is used to describe all relatively rapid forms of mass wasting. Mass wasting may be divided into two broad categories: slope failures and flows. Slope failures occur when debris moves downslope as the result of a sudden failure on a steep slope or cliff. Flows occur when a loose mixture of debris, water, and air move downslope in a fluidlike manner. 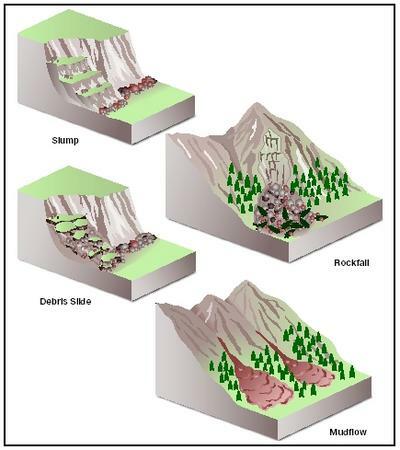 Each of these categories may be further divided into various types: Slope failures include falls, slides, and slumps; flows include mudflows, debris flows, solifluction (pronounced solih-FLUK-shun), debris avalanches, earthflows, and creep. Flows may be grouped according to the amount of water present in the particular flow. Mudflows, debris flows, and solifluction are labeled slurry flows. These contain between 20 and 40 percent water. Debris avalanches, earthflows, and creep are granular or dry flows, which contain up to 20 percent water. A fall is a sudden, steep drop of rock fragments or debris. A rockfall commonly occurs on a steep cliff and may involve a single rock or a mass of rocks. As a rock falls down, it may plummet freely through the air or may strike and loosen other rocks in the cliff face. At the base of the cliff, the rock fragments accumulate in a sloping pile known as a talus (pronounced TAY-less). The largest rocks in the pile tend to be located the farthest from the cliff face because of their greater size and momentum. Debris falls differ from rockfalls only in that they involve a mixture of soil, rocks, and vegetation. In contrast to a fall, material in a slide maintains contact with the slope down which it moves. That material could be a mass of rocks or debris. Piles of talus are common where rock or debris slides end. A rock slide involving tons of material may reach a speed exceeding 100 miles (161 kilometers) per hour. A slump is the downward movement of a block of material on a curved surface, one shaped like a spoon. Instead of sliding downward parallel to the surface of the slope, a slump block rotates backward toward the slope in a series of curving downward and outward movements, creating a series of steplike depressions. A bulge of material, known as a toe, develops at the base of the slope. At the head of the slump, a scalloped hollow is left in the slope. A slump generally does not travel far, unlike a fall or a slide, normally moving at a pace of 7 feet (2.1 meters) per day or slower. The most common, the most liquid, and the fastest type of flow is a mudflow. A mixture primarily of the smallest silt and clay particles and water, a mudflow has the consistency of newly mixed concrete. It can travel down a slope as fast as 55 miles (88 kilometers) per hour and have enough force to pick up and carry along debris the size of boulders, cars, trees, and houses. Mudflows can travel for great distances over gently sloping terrain. When they reach valley floors, mudflows spread out, depositing a thin layer of mud mixed with boulders. A type of mudflow produced by a volcanic eruption is called a lahar (pronounced LAH-hahr). A mixture of volcanic ash, rocks. A mixture of water and clay, silt, sand, and rock fragments (more than half of the particles are larger than sand), a debris flow travels at a slower speed than a mudflow, usually up to about 25 miles (40 kilometers) per hour. At this velocity, a debris flow still has enough energy to pick up and transport large rocks, boulders, trees, and other material in its path. This type of flow generally occurs on steep slopes that have little or no vegetation. Traveling downward, the material in a debris flow tends to mix with more water and even air. Studies have shown that debris flows gain speed because they actually ride on a cushion of air as they flow downslope. The slowest type of slurry flow is called solifluction. This form of mass wasting occurs in relatively cold regions where short summers thaw the uppermost layers of soil, generally the top 3 feet (1 meter). Below this remains a layer of permanently frozen soil called permafrost through which the water does not drain. Water-saturated and weak, the upper layers flow very slowly downslope at a rate of 0.2 to 5.9 inches (0.5 to 15 centimeters) per year, forming distinct lobes (rounded segments). The fastest type of granular flow is the debris avalanche. The term avalanche is generally applied to any fast-moving downward flow of any type of material. Similar to an avalanche of snow, a debris avalanche is an extremely rapid downward movement of rocks, soil, mud, and other debris mixed with air and water. Common in areas with steep slopes, debris avalanches usually result from the complete collapse of a mountainous slope, often triggered by earthquakes and volcanic eruptions. They move downward through avalanche chutes (channel-like depressions along which an avalanche has moved), reaching speeds over 300 miles (480 kilometers) per hour. Debris avalanches can travel for considerable distances along relatively gentle slopes. Another type of granular flow is an earthflow, which usually occurs when clay-rich soil has become saturated by heavy rains. The material in an earthflow is coarser and less fluid than that in a mudflow and finer and more fluid than that in a debris flow. Although it may move at a variety of speeds and over varying distances, an earthflow generally moves slower and travels a shorter distance than a mudflow. Slow earthflows move in starts and stops, covering only several feet per year. This type of flow normally has an hourglass shape. A bowl or depression forms at the head where the unstable material collects and flows downward. It narrows in its central area before widening once again at the base of the slope. Creep is the extremely slow, almost continuous movement of soil and other material downslope. Most creep movement is less than 0.4 inch (1 centimeter) per year. Occurring on almost all slopes, it is the most widespread and costliest type of mass wasting in terms of total material moved and monetary damage caused. Although creep cannot be witnessed, evidence of the movement can be seen on hillslopes in curved tree trucks and leaning fence posts, telephone poles, and gravestones.